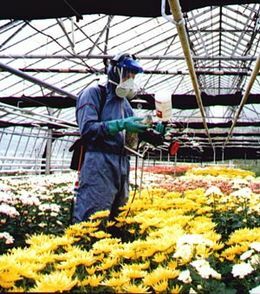 The greenhouse environment is unique and demands crop-spraying strategies altogether different from those adopted in the field. Nowhere are higher-value crops grown so intensively and biological control, employing programmed release of predators and parasites, used so widely. The luxuriant growth and densely packed foliage of a healthy greenhouse crop may pose several problems related to the safety and efficacy of water-based sprays using traditional high volume hydraulic sprayers. Foliage, already susceptible to moisture related diseases such as Botrytis (gray mould), is made more so by the effects of water-based sprays applied by in high volumes. It is difficult to obtain efficient coverage without the use of air-assistance and operators find difficulty moving unhindered and uncontaminated between rows of greenhouse grown crops carrying bulky knapsack sprayers. Requirements are for targeted sprays using low doses of pesticide formulated in non-aqueous carrier liquids or the minimum amount of water. Air assistance is essential to give droplets added momentum and to open up the canopy for efficient coverage. Micron Sprayers, designer of innovative spray application techniques provides a range of hand-held air-assisted ULV sprayers dedicated to greenhouse application. The sprayers, which include mains-powered (Turbair Electrafan 110/240) and battery-operated (Turbair Electrafan 12) models, are used to apply pesticides, growth regulators and fertilisers to greenhouse crops throughout the world. Growers in the Netherlands, which has one of the biggest and most innovative industries, use large numbers of these sprayers either off the shelf or in units custom-designed for their own greenhouse spraying requirements. 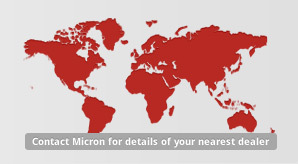 One recent convert to Micron’s sprayers is Mr A. Van der Valk-Den Drijver, a specialist grower of capsicum peppers at Honselersdijk, Netherlands. Mr A. Van der Valk, who has been using Micron’s battery-powered 12V Turbair Electrafan sprayer for more than a year, is highly enthusiastic about the machine. “Use of the Electrafan 12 is completely compatible with our strategy to use beneficial insects as the mainstay of the crop protection programme. Agrochemicals are only applied when absolutely necessary and in the smallest effective quantities. ‘Hot spots’ of fungal infection and pest infestation requiring prompt action do occur, says Mr Van der Valk. The quicker we act the easier it is to eliminate the problem without disturbing the delicate balance between beneficial insects and their insect pest hosts and prey. This lightweight and totally mobile, battery-operated sprayer is ideal for quick spot spraying of pest and disease hot spots around the greenhouse. The air assistance produced by the Electrafan 12 allows excellent droplet penetration into the crop canopy to give good control at dose rates 50% lower than standard”, he said. Bunnik Plants of Bleiswijk, growing 3 hectares of nursery stock (pot plants) in an automated greenhouse, have been using 12 Electrafan 12’s simultaneously for two years with just one person in sight. This feat is achieved by the ‘Flying Doctor’, a custom-built robotic sprayer featuring a dozen Electrafan 12’s powered by a large central battery and secured to a remote-controlled frame that moves back and forth above the crop to spray as required. “When the greenhouse was built we invested a large part of our input in the use of environment friendly pest control systems based on predator and parasite release”, says Managing Director Frans Bunnik. More user testimonials can be found on our testimonial page.